In 2010, hand and upper extremity surgeon, Dr. Alejandro Badia, and his partner, Justin Irizarry, identified an opportunity to revolutionize the multi-billion-dollar orthopedic healthcare delivery system while achieving the healthcare industry’s Quadruple Aim of better outcomes, lower cost, improved patient experience and improved clinician experience. Dr. Alejandro Badia, Chief Medical Officer of OrthoNOW was featured in a recent interview published by Medium. I am excited to share this interview, written by Yitzi Weiner, regarding his role as CMO, overcoming business challenges, and more. Read the full interview below. “Your executive team is crucial and an important skill set. 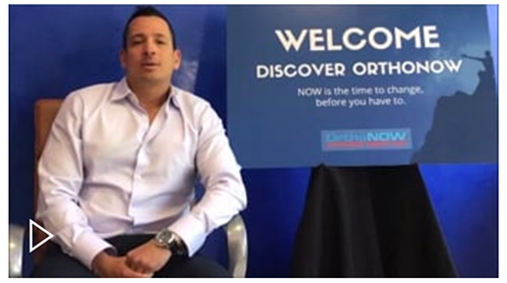 MIAMI —April 9, 2018 OrthoNOW has announced the appointment of Nick Mendez as its new CEO, effective immediately. He will be based in Nashville, Tennessee, the capital of the U.S. healthcare industry. Mendez will work closely with Dr. Thank you for attending the OrthoNOW Seminar. Please fill out the form below and you’ll receive an email with the presentation. If you have any questions, please contact Christine Dura at Christine@OrthoNOWFranchise.com or by phone at 800.951.3141. Justin Irizarry, Co-Founder and Chief Financial Officer of OrthoNOW Franchise, has been awarded a 2018 CFO of the Year Award by the South Florida Business Journal. The program honors financial professionals with a strong record of innovation in their fields, outstanding performance in their businesses and a clear track record of meaningful community involvement. As the CFO & Co-Founder of OrthoNOW, Irizarry has developed an innovative business model that changes how people access expert orthopedic care on-demand and at a cost-effective rate. Hospitals and other health care providers are increasingly opening urgent care centers to reach patients faster and more cost effectively. Urgent care centers cover a crucial gap between clinics and emergency departments. They are available for walk-in visits and their services aren’t as expensive as the emergency room, so they save money for both patients and health providers. OrthoNOW Urgent Care Franchise: Right Business. Right Industry. Right NOW. It is no secret that America is suffering under a broken healthcare system. Those who seize the opportunity to provide efficient, expert, and affordable healthcare solutions stand to reap the highest rewards. OrthoNOW is seeking proven thought leaders to stand together and answer the call of millions of Americans. REGISTER TODAY FOR EXCLUSIVE ONLINE WEBINAR to learn more. OrthoNOW Urgent Care Franchise Chief Development Officer Christine Dura recently joined host Pamela Currie of Franchise Business Radio for an exclusive and intriguing interview sharing her expert advice on franchising. See below for the podcast.